The 2018 Grey Cup Festival will feature more than 50 ticketed and free events — including acts like Alan Doyle, Loverboy, The Rural Alberta Advantage and Aaron Pritchett. A range of entertainment booked for the Grey Cup festival aims the bring the party to the streets of downtown Edmonton when the football final comes to town in November. The festival will feature more than 50 ticketed and free events — including acts like Alan Doyle, Loverboy, The Rural Alberta Advantage and Aaron Pritchett — when the 2018 Grey Cup Festival kicks off on Wednesday, Nov. 21. The 106th Grey Cup happens at Commonwealth Stadium on Sunday, Nov. 25. 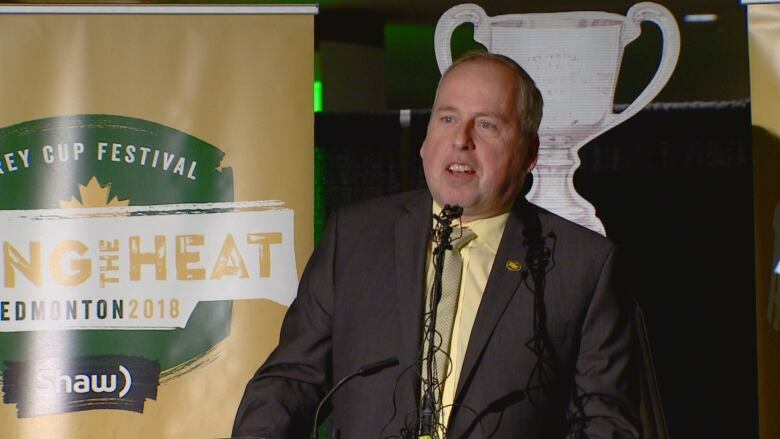 "We wanted to have a little bit of hard rock, have a little bit of hip-hop, have some country, have old school, have some new, have some emerging artists," said Duane Vienneau, Grey Cup Festival executive director. "We really wanted to try and have something for everybody." The Grey Cup Festival site on Jasper Avenue will feature free concerts on Thursday, Friday and Saturday including acts like Tim Hicks, Maestro Fresh Wes, The Strumbellas, The Royal Foundry, Notorious YEG, Jay Sparrow, and Whale and the Wolf. The Grey Cup halftime show headliner will be announced at the next Eskimos home game, Sept. 29 against the Winnipeg Blue Bombers, said Eskimos president Len Rhodes. Organizers estimate the economic impact of the game and four-day festival could be anywhere between $80 million to $100 million. As of Wednesday morning, 53,268 tickets had been sold for the Grey Cup but there are still tickets available. Full details of the festival can be found at greycupfestival.ca.